Private one to one, and up to one to twelve person sessions are run from our studio in Narberth, where larger equipment is available for use. The Studio Sessions are tailored to suit the individual requirements of the client. 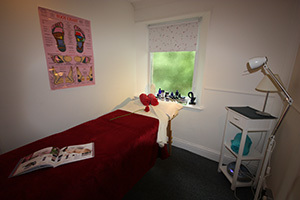 This especially suits rehabilitation needs, where the client can enjoy one to one attention in the privacy of our comfortable studio, and can be assured of the best possible treatment and instruction. There is a changing room with toiletry and shower facilities and cooled water for your comfort and hydration. The 1hour 30mins initial assessment will normally start with a talk about the contents of your Health Questionaire, where further information may be uncovered as to the possible reasons for any injuries or restrictions you may have now. This will take place in the comfy seating area. This will be followed by a full body analysis in front of the mirrored wall, when you may discover you are not as straight as you may have thought, but don't worry! Pilates will be just the thing you need to bring your body back into alignment, so it can work efficiently and without pain. We have witnessed many mini-miracles in our client base as described on our Testimonial Page. We do not profess to make miracles - We just apply the Pilates Method to the client and this has proven time and time again that Joseph Pilates got it right. 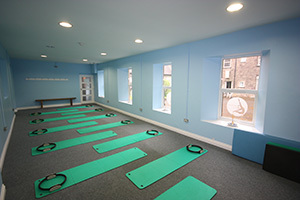 The rest of the initial assessment will consist of either re-habilitation work or an introduction to the Pilates Method, which will both inform and prepare the client for group matwork classes. In either case, we may jointly decide that further one to one sessions at the studio are the preferred route prior to joining group classes. You can expect to be given some homework to take away! Some clients only come to the Studio as they enjoy the use of the available equipment such as our Peak Performance Reformer with Half Trapeze, which can assist or provide resistance to a move as required by the individual. This equipment was devised by Joseph Pilates when he was helping fellow internees in their hospital beds, to maintain movement and improve core strength, using springs and straps as he could find them. A true genius and way ahead of his time. 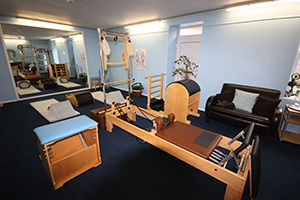 Equipment used in the studio includes Reformer with Half Trapeze, Wunda Chair, Foot Correcter, Rings, Large and Small Balls, Bands, Weights, Mats, Poles and Wedges.